It’s been a rough week for the Tri-State area. 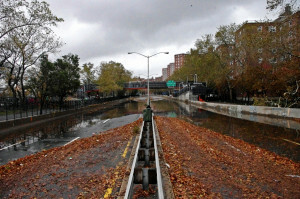 The arrival of Hurricane Sandy Monday evening was far from pleasant, to say the least, and devastating for many. The waterfront property of the Jersey Shore took the worst of it. So far, we know of 67 deaths, 19 in Staten Island alone. As of Friday morning, there were 4.5 million homes without power as the recovery continues. Seven years ago, when several of us on the SixEstate team went through Hurricane Katrina, there were relatively few online tools. Blogs were the centerpiece of online communications, providing “feet on the ground” info, unbiased by the need to court ratings. Now the East Coast finds themselves facing the aftermath of Hurricane Sandy, but with a dizzying array of communications tools in hand. For example, I was able to track down almost all of my friends in half a day thanks to Facebook and Twitter. Seven years ago, it took me almost three weeks to locate my grandmother. I’ve often said that I wish we had today’s social media tools when Katrina hit, and I am thankful that it exists today. Let’s take a look at one positive example and one negative example. It is commendable that the NY Fire Department uses Twitter, but, like with all social media, a lot depends on the person providing the voice for that channel. The night that Sandy struck NY Emily Rahimi was indespensible. As the night passed, the FDNY Twitter feed filled up with conversations between Rahimi and the city’s distressed victims. ‘My sis family at 78th St155-22 Howard Beach Queens NY 11414, water rising 12 ft need help. 1st floor drowned, kids scared,’ @rsindh tweeted. As the overburdened 911 lines ceased to be useful people started reaching out over Twitter. Rahimi would take down their info and get it to her dispatchers, sending aid to those who might otherwise have been lost to the endless busy signal. For Rahimi, the most satisfying part are the responses she is now starting to receive from people who did get help. Imagine the satisfaction of knowing someone was rescued because of your work. Later, it was determined that one account was responsible. The person behind the @ComfortablySmug Twitter account anonymously posted the information as it was fact. That is, until some digital sleuthing from BuzzFeed unmasked the social media pariah. Turns out, this New York City hedge fund analyst was also a GOP congressional campaign manager. Was, because he resigned from that post in the apology post. The Twitterverse wasn’t very sympathetic to his plight. Many just wanted to know why. Many wanted to know if he was sorry for what he did or for getting caught. Only a few commended him for owning up to what he did. And just like that, the damage was done. Within the span on 24 hours, a once anonymous Twitter user posted a few 140-character tweets, was outed on the Internet by a major website and resigned from a congressional campaign a week before the election. This is a great example of what I mean when I say “transparency is coming — whether you want it or not.” If you are active online you can be traced and outed, so be careful what you do. Spreading misinformation during a natural disaster should have legal consequences, as it is one of the most unethical and outright dangerous things you can do with social media. The shift toward real-time interaction has been a great boon during the current disaster. As a matter of fact, I would offer that the rapid debunking of falsehoods is just as important as helping people find water and food. There are always people and media entities attempting to spin the situation to their own ends, a criminal stance when lives are still on the line and people are suffering. Most of our team have ties to both New Orleans and New York City. That being the case, we understand what they are going through. Our best wishes and hopes go out to all of those on the East Coast. It will be a trial, but you will get through it. In the meantime, keep using the tools to debunk the falsehoods, help each other, and get the real story out!